I want to write like Ernest Hemingway, tell stories like Mark Twain, and create books that grab the reader from the opening line. I knew right then I wanted to be a writer, but I didn’t dare tell a soul. As I grew up, when people asked what I wanted to be, I told them a policeman, a race car driver, a preacher, and, much later, a lawyer. I never became a policeman but I drove a race car, preached a few sermons, and practiced law. And as time passed that childhood dream of becoming a writer receded deeper and deeper into my mind. By the time I was a lawyer, I never thought about it at all. ﻿﻿Then one morning, one of the legal assistants came to the office looking groggy and tired. I needled her about how late she’d stayed up the night before and she snapped, “I have a life besides coming to this office!” I thought, “Hey, I have a life bigger than this office, too,” and that long forgotten childhood dream came alive once again. That evening, I went to work on my first project, a screenplay. As you might imagine, writing it was more difficult than I first thought but by the time I finished, I was hooked and started another. Doing that gave me the courage to attempt a novel and three versions later, I came very close to getting it published. Close—but not quite close enough. By then I was no longer a lawyer writing in his spare time but a writer with a day job. When I walked out the door of the law firm for the last time I didn’t have a publishing contract, or an agent, or even an outline for a book. All I had was an idea for a character, a sketch of a story, and a wife who believed in me. She was soon to show just how deep that belief ran. Over the years, we had accumulated financial assets, but not enough to produce a livable income. To pay the bills we had to liquidate our investments. 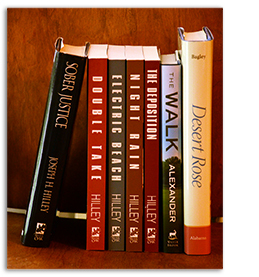 Getting published took longer than I expected but as we drew the last few dollars from the retirement account, my first book, Sober Justice, was published. It did well but not nearly well enough to solve our financial problems and we were out of money. When I told my wife about it she just smiled and said, “I’ve been praying about this. Let’s sell the furniture. We’re not stopping now.” So, we sold the furniture and when that was gone, we sold the house. Then, friends helped out while we wrote more books. When I began writing full time we lived along the Gulf Coast of Alabama, not far from Grand Bay, the town where I grew up and from which I found many of my favorite stories. A few years ago we moved to Houston, Texas. I continue to write under my own name, but I also spend much of my time writing books for other people.